Matjana Preschool has received donations in many shapes and sizes since its beginning in February 2007. 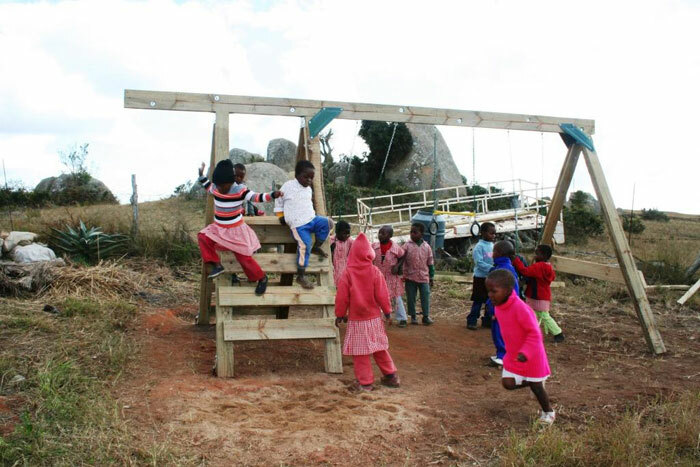 One of the most recent and extraordinary contributions made to the school came from an American family, who came to Kaphunga and spent their holiday building the kids at Matjana a world class swing set and climbing frame. 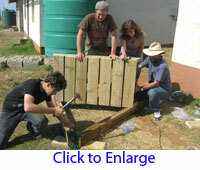 Trina Bowen, or Mum in the family context, did the shopping online and purchased a DIY kit- that was the easy part. The kit then travelled with the Bowen-Forrests on the plane to Swaziland. 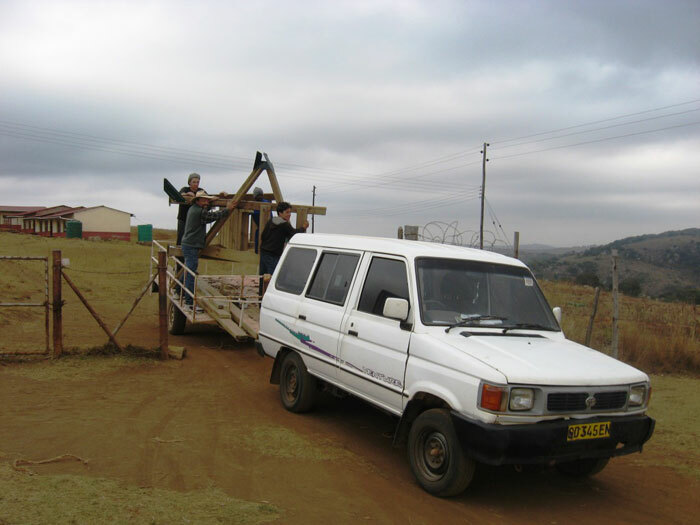 The timber for the frame was purchased in Manzini, the closest major town to Kaphunga, but what seemed at first like it would be an easy shopping trip became a bit of an epic. "The big supply store in Manzini didn't have some of the pieces we were expecting to get, and everything was in metric measurements. Then, actually paying for the stuff required a conference in a special room behind bars – literally," Steve Forrest (aka Dad) told me. The adventure continued, when plans to transport the timber to Kaphunga fell through. Luckily Myxo from Woza Nawe Tours who organised the family's stay in Kaphunga, was able to use his trailer to transport the planks to the preschool. It seemed at that point that the difficult part was over, but then someone remembered that power drills and saws require electricity- a luxury which simply doesn't exist at Matjana Preschool at the moment. Luckily, Matjana Primary School (who have helped us out on numerous occasions) allowed us to plug in on their premises- even on the weekend. 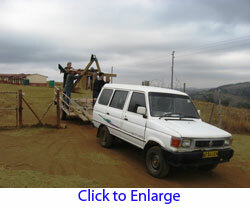 But there was still the task of loading everything back on the trailer to move it to the primary school. And constructing a DIY swing set in the middle of nowhere is perhaps not as easy as it looks. "Actually fastening things was tricky because our hardware was English, while our tools were metric. We didn't have sockets to reach into deep holes, and at one point, we even borrowed a screwdriver from a fellow Myxo knew. But we kept plugging away, figuring out problems as we encountered them, and ultimately had the set ready to go," Steve told me. The weekend's work finished with putting the partially constructed frame back on the trailer, transporting it back to the preschool, reassembling it, and planting it in the ground. By Monday morning no one would have imagined that an American family had slaved away the whole weekend. But the kids noticed something was a bit different when they entered the school grounds and apparently the hard work was well worth the effort. "Then came the payoff," Steve told me. "Many of the children had never been on a swing before, so it took a bit for them to get the hang of it. But once they did, they were off and running. They would wait in line, counting to 10 at the tops of their lungs, as each child took their turn, then let the next climb on. 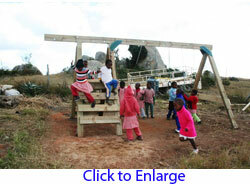 The climbing platform was a huge hit, too - kids were jumping off and flying one after the other. "We also had a very gratifying meeting with several of the parents. They were very appreciative, and it was an honour to have done this for them and their children. For both me and my wife, and especially our kids (Galen and Aidan), this time at KaPhunga was one of the most memorable and meaningful times of our lives. 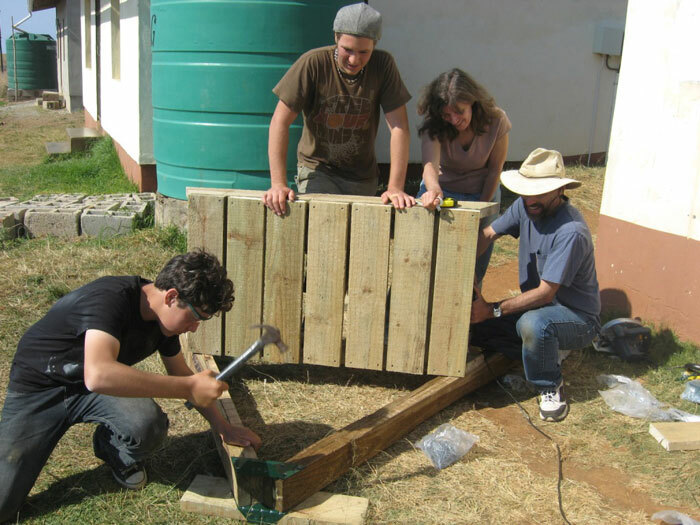 "On the one hand, we didn't 'travel' a lot in Swaziland - a lot of our time was spent simply being at Myxos' place and working on the swingset. But doing that allowed us to enter (in a very small but meaningful way) into the life of the village in a way that would never have happened just as regular tourists.